Rick was the first employee of HIRRS in 1991, starting as the rehabilitation coordinator. He has over 25 years of experience working with individuals with brain injury. Rick served as the agency’s vice president for 8 years prior to becoming president in 2009. He has a Bachelor’s Degree in Psychology from the University of Notre Dame and a Master’s Degree in Science, specializing in Not-For-Profit Management, from the University of Maryland’s University College. Maggie has worked with brain injured adults in various capacities for the past 16 years, in direct care as well as administrative positions. Her current position requires her to monitor quality issues within the entire agency. She is also responsible for meeting with potential clients and matching these individuals to the comprehensive brain injury supports provided by HIRRS, or assisting the individuals and their families in finding appropriate services in Maryland. Maggie graduated with a BA in Psychology from the University of Maryland, College Park. In addition to working in brain rehabilitation, she has also worked with the cognitively challenged and mentally ill at programs in the state. In 2004, Robert began working at HIRRS as a Speech Pathologist. He was promoted to his current position as the Director of Rehabilitation in 2007. Prior to working at HIRRS, Robert worked at an acute care hospital on Maryland’s Eastern Shore. He earned a Bachelor’s Degree in Asian Studies and a Graduate Diploma of Education from Monash University. Robert later earned his Master’s of Science in Speech Pathology (CCC-SLP) from the University of Arizona. In addition, Robert completed two years of undergraduate study at Nanjing University in China and taught for two years at the junior high school level in Ogaki, Japan. Debbie Jones graduated from the University of Maryland in 1998 with a degree in Criminal Justice. Immediately following graduation, she began working at HIRRS as an employment specialist. Previous to earning her degree she raised three children and owned a small business. During the nearly 14 years at HIRRS, she has worked with individuals in all programs providing supports in homes, at jobs and in the community. As the Director of Individual Support Services she and her staff provide assistance with daily living skills and companionship to individuals living independently in the community. Janet has been HIRRS' Director of Community Living Services for the past six years. She has worked with individuals with co-occurring disorders including mental health issues, substance abuse and brain injury, for the past twelve years. Janet completed her Bachelor’s Degree in Psychology from Richard Stockton College of New Jersey. Sarah completed her undergraduate degree at St. Bonaventure University prior to earning two Master’s level degrees from George Washington University. 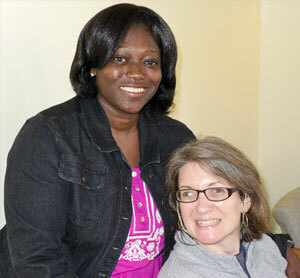 In addition, she is a Certified Rehabilitation Counselor. Sarah began working at HIRRS as a cognitive rehabilitation assistant and soon moved to the vocational department. In the vocational department, Sarah plans to focus on assessment and placement.